As a veteran martial artist of three other schools and fighting styles and before coming to embrace the philosophy and soft dynamism of Grand Master Nobuo Maekawa’s unique power, I was curious. I knew of Master Morihei Uesheba’s Aikido – I had read his books, seen old film cuts, and watched different forms of it being practiced in several Dojos around Okinawa, but I always felt that those who taught it lacked the integration of Aiki power that I had understood must be the source of force beyond the flowing graceful technique. I was fortunate therefore to find Master Umeda’s Daito-ryu Aiki-jujitsu, learning from him the root of Daito-ryu. As I advanced to Shodan and nodal I, in turn, also was given the chance to meet, experience and slowly gain the growing presence of his own friend and Aikido Grand Master Nobu Maekawa. It was in the receiving of his direct transmission of Aiki energy in brief flashes of contact in one-to-one training that I first felt the spiritual unity of true soft power. 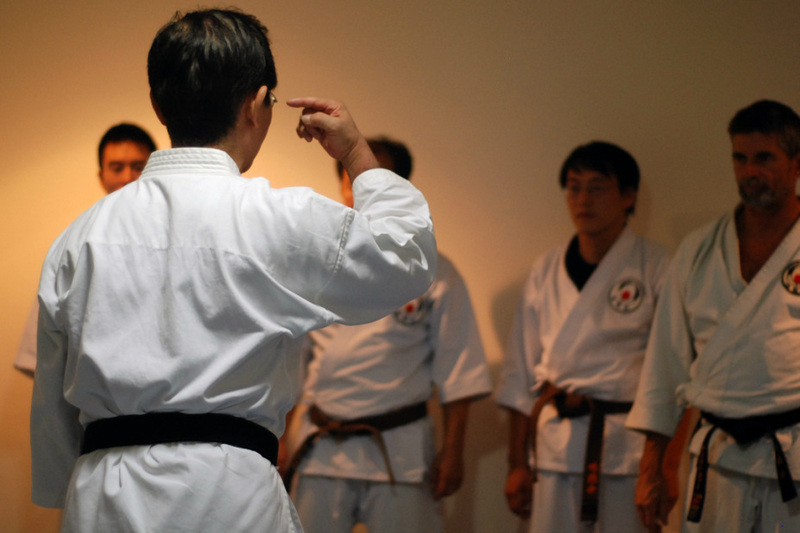 Then in the growing trail of workshops and demonstrations given by Grand Master Maekawa, my life was swiftly and irrevocably transformed as a practitioner in the life of martial arts. After tasting the subtle dynamism of his style, I wanted to study both arts. I was therefore given the chance to attend the on-going program run by Grand Master’s oldest friend Master Matsukawa in Urasoi, the training house in Okinawa. There I met the core group of his most advanced and devoted students, and through them I realized the practiced distinction of the Grand Master’s teaching beyond skills--the ever deepening spirit of brotherhood that consummates this art. In Meikaku-kai Aikido, there is no competitiveness, no hierarchy, no sense of inner-circle elite--only a community’s deep desire to share these qualities and to raise this art to the pinnacle of personal power for each student. As the name in Japanese expresses in symbol and word, we are a spiritual brotherhood of practitioner of an ancient yet still-evolving dynamic art--an art that has multiple roots yet always yields the same flowers, demonstrated in every Aiki Dojo: respect for one another, patience in teaching the intricate and subtle arts, kindness as softness and careful control in conveying even the most dangerous secrets of self defense.